Agam Hamzah is one of a number of extraordinary Indonesian guitarists brought to the attention of the wider world by Leonardo Pavkovic, owner of the determinedly eclectic MoonJune Records, whose travels in that region of the world have resulted in some real musical gems in the area loosely described as jazz fusion being given the wider attention they deserve, Agam’s swamp-jazz power trio Ligro being one of them. Ligro when read in reverse apparently means “crazy” in Indonesian, and a spirit of fun and mischief with a glint in its eye runs through this absorbing record. 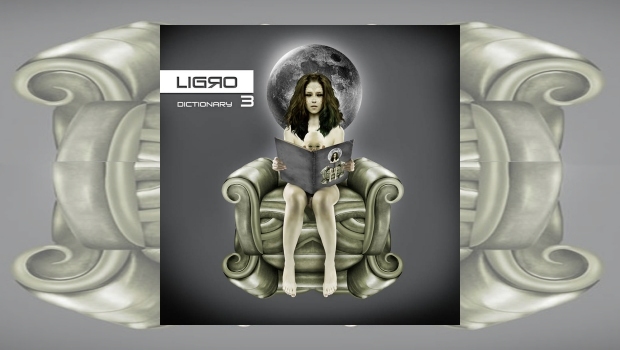 As the title hints, Dictionary 3 is the band’s third album, the second making me wax lyrical over on DPRP back in 2012. The steamy jungle vibe continues on this fine record, the humid psychedelic improvisations of Pentagonal Krisis slowly rising with the sun as the jungle stirs. Some massively expansive guitar playing on this track and indeed on the entire album illuminates the foliage, previously concealed creatures scattering in its path. The drums provided by Gusti Hendy skitter around the beat, playing off and with Adi Darmawan’s highly dextrous bass guitar with instinctive glee. Ligro are less obviously ethnic than some of the other Indonesian combos on the label, and the band have absorbed the more experimental side of Hendrix, along with the Mahavishnu Orchestra’s soaring spiritual vibe. The ethnicity is still there, but it is never dominant, as it may sometimes be with, say fellow MoonJuners simakDialog (who, incidentally are utterly fabulous). Less ethnicity is not a plus or minus point, merely a difference. With a mere five tracks on the record, and none under eight minutes long, each excursion has the time to expand and develop. Whereas Pentagonal Krisis unfolds in a thrilling switchback ride of searing improvisation, opener Bliker 4 is held to a more traditional jazz groove, enhanced by the guest piano and keyboards of Ade Irawan. Although still improvised, it is a more structured affair but no less interesting for that, some great interplay between Agam’s knife-blade guitar and Ade’s organ and piano being a particular highlight. Ligro are one of my favourite MoonJune power trios because I prefer my jazz fusion with an edge, and boy do Agam and his mates provide that, and then some. Even a slower, more spacious improv such as Tragic Hero will have you dodging chunks of space debris in the Magellanic Clouds before you have time to get cosy in your own particular spacecraft. The 20th Century Collaseu which is based on a work by Oliver Messiaen, that most prog of classical composers, and Anton Webern sounds unsurprisingly very Crimsoid in places as it charges along at a great rate of knots. This is edge-of-seat playing at a thousand miles per hour, but much like McLaughlin’s mighty Mahavishnu Orchestra, it is full of soul, a difficult combination to achieve with such a demanding and technical piece of music. We play out with Lonely Planet, a slow reflective Hendrixy blues of the Cry Of Love vein, and it is quite lovely. A suitable way to play out a thrilling album, Dictionary 3 is a must have for any fan of hard-edged guitar based jazz fusion.